Taking your dog on vacation is a great way to include the entire family on your next holiday away from home; however, finding pet-friendly hotels can be tricky. To make the job easier, we’ve compiled a list of the top 100 best hotels that allow dogs throughout the U.S., categorized by state, so start packing your suitcase and don’t forget to bring a doggy-bag too! With an average “superb” rating of 9.2 out of 10 and 290 reviews, Drury Inn is in high demand by pet owners! 5 miles from Birmingham, Alabama, this affordable inn offers a breakfast buffet that’s included in the cost of your room, free on-site parking, free wi-fi, and a swimming pool. To stay at the Drury Inn & Suites with Pets you must request a pet-friendly room prior to booking and additional charges may apply. The Voyager Inn has an average rating of 9.1 out of 10 from 231 guest reviews and is recommended by many of those guests for the comfort of their beds alone! All rooms at the inn include a refrigerator, microwave and coffee machine. There is also a swimming pool, 24-hour front desk, spa, and wellness center on-site as well as free wi-fi for all guests. Take note that guests staying with their pets are permitted but additional charges may apply. A superbly rated resort and spa, the Royal Palms has an average rating of 9.2 out of 10 from 133 guests and it’s easily one of the best hotels that allow dogs on the list! Recommended for their comfortable beds, the resort offers rooms with a balcony, mountain view, or patio, and all rooms have free wi-fi access. The resort itself also offers a fitness center, hot tub, bar, breakfast (not included), swimming pool, a business center, minibar in each room, and babysitting services. Guests with pets are welcome, but there may be additional charges associated with pet guests. Rated an incredible 9.8 out of 10 by guests, The Canyon Suites offers rooms with a balcony with a view and rooms with a mountain or pool view. The resort offers a swimming pool, restaurant, and bar as well as a 24-hour front desk, swimming pool and fitness center. WiFi is not free and costs $29 per 24 hours, but it is accessible in all areas of the resort. Guests are allowed to bring their pets to stay at The Canyon Suites, but additional charges may be applicable. Rated 9.7 out of 10 by guests, the Sanctuary Camelback Mountain is one of state’s top hotels that allow dogs and is a scenic resort with an Asian-themed spa on-site. The resort offers a business center, bar, restaurant, on-site parking, concierge service, 24-hour front desk service, free Wi-Fi, hot tub, fitness center, and sauna. Guests with pets are welcome on request, but additional fees may be applicable. Rated 9.5 out of 10 by guests, the Home2 Suites by Hilton offers free Wi-Fi to guests and has a swimming pool, indoor pool, fitness center, 24-hour front desk, business center, and a mini-market on site. The attractive neighborhood is frequently praised by guests and pets are allowed on request, but additional fees may be applicable. Rated 9.0 out of 10 by 370 guests, The Kimpton Everly Hotel is recommended by guests for the comfort of their beds and they offer rooms with a view as well as being one of top hotels that allow dogs. With private-parking on-site, the hotel offers a swimming pool, a fitness center, a restaurant, a bar, concierge service, babysitting services, massage services, special diet menus, and free WiFi. Pets are permitted to stay at The Kimpton Everly and there are no extra charges associated with pet guests! Rated highly by guests at 8.7 out of 10, the Cypress Inn offers free WiFi and is recommended by guests for the comfort of their beds and their prime location. Offering room service, a bar, a restaurant, concierge services, and multilingual staff. The hotel does not have parking available to guests, but street parking may be available. Pets are permitted in the Cypress Inn, but additional charges may be applicable. Ranked 8.4 out of 10 by guests overall and 9.2 for location, the Fairmont Miramar Hotel and Bungalows are within a prime area of Los Angeles and has private parking available on-site; it’s one of more unique hotels that allow dogs. With a swimming pool, fitness center, spa and wellness center, an electric vehicle charging station, currency exchange, multilingual staff, babysitting services, a hot tub, and massage services. Guests can bring pets on request and there are no additional charges associated with pets staying. Rated 9.4 out of 10, The Beverly Hills Hotel is a landmark hotel with free WiFi throughout, private parking on-site for a fee, and the hotel offers concierge service. The hotel has a swimming pool, hot tub, massage services, fitness center, sauna, soundproof rooms, room service, a 24-hour front desk, currency exchange, shops on-site, and multilingual staff. Guests are permitted to bring pets on request but additional charges may apply. Rated 9 out of 10 by guests, Calistoga Ranch is a scenic resort with a mountain view and one of the best hotels that allow dogs. The resort offers free WiFi, a fitness center, a spa and wellness center, a minibar in each room, a restaurant on-site, a bar, grocery deliveries, a coffee machine and refrigerator in-room, concierge service, a 24-hour front desk, a swimming pool, massage, sauna, and free private parking. Guests with pets are permitted although additional charges may apply. 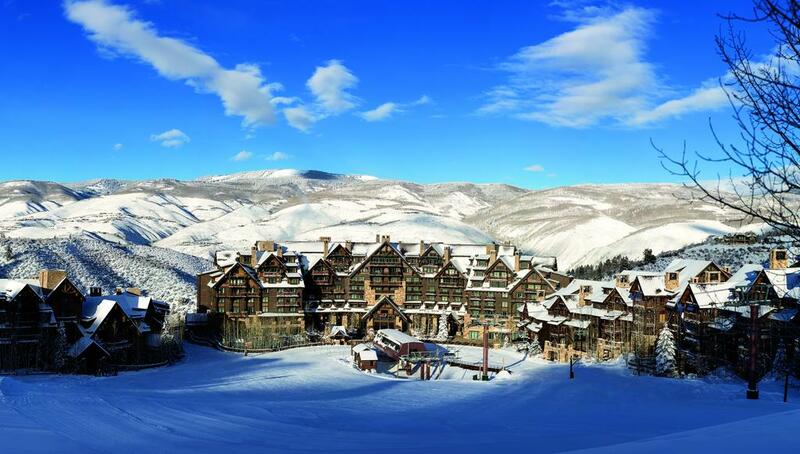 Rated a 9.1 out of 10 by guests, The Park Hyatt Beaver Creek Resort is known by guests for its pet-friendly facility and their rooms with a view. Skiers can ski up to the door of the resort and private parking is available on-site although additional fees may be applicable. The resort offers a swimming pool, fitness center, free Wi-Fi, bar, restaurant, massage services, sauna, hot tub, concierge service, ski school and ski hire. Guests with pets are welcome on request but additional fees may apply. Rated 9.1 out of 10, the St. Regis Aspen Resort is set in the heart of all of the action in Colorado and it’s one of state’s top hotels that allow dogs. The hotel offers guests a swimming pool, spa and wellness center, a bar, a fitness center, ski equipment on site, sauna, massage, babysitting, concierge service, and numerous on-site activities. Parking is available but comes at a cost of $40 per day and Wi-Fi access is also available for a fee. Guests may bring pets on request, but additional fees may apply. Rated 9.5 out of 10, The Little Nell offers rooms with a city or mountain view, has free WiFi access and skiers can ski to the door of the resort! Parking on-site is available but does cost $32 per day. Guests can also enjoy a swimming pool, hot tub, massage, spa and wellness center, a fitness center, a restaurant, a bar, concierge services, minibars in the rooms, and offers allergy-free rooms. Guests with pets are allowed on request, however, additional charges may apply. Rated 9.4 out of 10 by guests, The Ritz-Carlton Bachelor Gulch is another one of top Colorado hotels that allow dogs and offers guests rooms with a mountain view as well as free WiFi and ski to door services. The resort also offers a kids club, business center, grocery deliveries, in-room refrigerator, on-site shops, a coffee house, a restaurant, a bar, a swimming pool, yoga classes, a fitness center, spa services, and a sauna. Guests may bring their pets although additional charges may be applicable. Parking is also available nearby, however, it comes at a cost of $60 per day so it’s best to go without a car if you can! Rated 8.9 out of 10 by guests, the Delamar Southport offers guests free on-site parking and free WiFi access. The resort also offers a bar, restaurant, spa, fitness center, beauty services, wellness packages, free bicycles for use of guests, a business center, concierge service, and a 24-hour front desk. Guests may bring pets on request but additional charges may be applicable. Rated 9.1 out of 10, Woodstock Sustainable Farms is a highly recommended hotels that allow dogs and is a very pet-friendly resort that offers guests free WiFi access and free on-site parking. Guests have access to a sun terrace and massage facilities as well as a 24-hour front desk. Pet stays must be requested ahead of time and additional charges may apply. Rated 9 out of 10 by guests, the Canalside Inn is located in an ideal area for shoppers and it offers free parking on-site. Free bicycle use is available to guests and the inn also offers a swimming pool, free WiFi, swimming pool, hot tub, and a plunge pool. Pets are allowed to stay on request but additional charges may apply. Rated 9.4 out of 10 the Springhill Suites is a top notch choice among hotels that allow dogs and it offers free WiFi access and free parking to all guests. The hotel offers a 24-hour front desk, business center, in-room refrigerator and microwave, an optional sofa bed, a snack bar, a tea/coffee maker, and a swimming pool. Guests may bring pets to stay at the Springhill Suites but additional charges may apply. Rated 8.9 out of 10 by guests, the Brazilian Court Hotel offers great local shopping, free WiFi for all guests, and free public parking or $27 per day private on-site parking. The hotel offers banquet facilities, rooms with a view, a barber/beauty shop, swimming pool, hot tub, room service, spa, massage service, fitness center, bicycle rental, concierge service, and a 24-hour front desk. Pets are permitted on request but additional charges may apply. Rated 9 out of 10 by guests, EAST, Miami offers rooms with a balcony view of the city or the ocean and it’s one of the most famous hotels that allow dogs in the state. Located in a great shopping area and with private parking on-site (for a cost of $40 per day), this hotel is raved about for their coffee! The hotel offers business and banquet facilities, snack bar, in-room breakfast, minibar, restaurant, bar, car hire service, free WiFi, soundproof rooms, electric vehicle charging station, hot tub, massage services, fitness center, swimming pool, concierge service, on-site ATM, currency exchange services, evening entertainment, and a 24-hour front desk. Pets are permitted to stay at EAST, Miami although additional charges may apply. Rated 9 out of 10 by guests, the Ritz-Carlton Sarasota is known for its comfortable beds, rooms with a view and for being in a great shopping area as well as being another well-known choice among hotels that allow dogs. Guests have access to the beach, a tennis court and tennis equipment, and a golf course. The hotel also offers on-site shops, swimming pool, fitness center, personal trainer, yoga classes, massage services, spa, beauty/barber services, pool, hot tub, sauna, business center, banquet facilities, and a 24-hour front desk. Guests may bring pets on request but additional fees may apply. Rated 8.5 out of 10 overall and 9.1 out of 10 for location, Hotel Indigo Atlanta Midtown is recommended highly for the comfort of their beds as well as for the convenience of their location. In a great area for shopping and with free WiFi, the hotel is within walking distance of the Atlanta Aquarium. Guests have access to a fitness center, public on-site parking ($29 per day), a business center, banquet facilities, packed lunch services, 24-hour front desk, ATM on-site, snack bar, in-room breakfast, restaurant, and bar. Pets are allowed to stay at the Hotel Indigo Atlanta Midtown but additional charges may apply. Rated 9 out of 10 by guests, the Andaz Savannah is one of the Georgia’s best hotels that allow dogs and is located in the heart of Savannah with city views and they are known for the comfort of their beds. Guests have access to banquet facilities, business center, special diet menus on request, in-room breakfast, restaurant, minibar, bar, room service, free WiFi in public areas, swimming pool, fitness center, concierge service, tour desk, 24-hour front desk, and public parking for $28 per day. Pets are permitted on request but additional charges may apply. The Perry Lane Hotel is located in the heart of Savannah and offers concierge service, a 24-hour front desk, live music, tours of local areas, free bicycle use, karaoke, games room, babysitting services, in-room refrigerator, business center, banquet facilities, heated pool, yoga classes, fitness center, beauty services, massage services, local attraction tickets, room service, soundproof rooms, car hire, bar, restaurant, minibar, snack bar, in-room breakfast, and WiFi (charges are applicable!) Pets are allowed to stay at the Perry Lane Hotel although extra charges may apply. Rated 8.4 out of 10, this small boutique hotel is located in the best area of Honolulu and offers rooms with sea or city views. It’s easily one of the more affordable and cheap hotels that allow dogs in Hawaii. Guests have access to free WiFi, a minibar, in-room coffee machine, concierge service, tour desk, 24-hour front desk, and private parking for $32 a day. Pets are allowed to stay at Hotel Renew but additional fees may apply. Rated 9.2 out of 10, the Four Seasons Resort Maui at Wailea is located in a great shopping area, offers garden and sea views, and is highly rated for the comfort of their beds! Guests have access to free WiFi, in-room coffee machine, water sport facilities on-site, local golf course, tennis court, babysitting services, business center, banquet facility, barber/beauty shop, room service, special diet menus on request, snack bar, in-room breakfast, bar, minibar, restaurant, private parking for $34 per day, concierge service, ATM on-site, 24-hour front desk, massage, fitness center, pool bar, spa, swimming pool, kids pool, fitness classes, yoga, and steam room. Pets are permitted on request but additional charges may apply. Rated 8.8 out of 10, Best Western Tyrolean Lodge offers guests free private parking on-site, free WiFi, and rooms with a mountain view and is considered one of the best value hotels that allow dogs in the state. Guests also have access to ski storage, live music performances, games room, swimming pool, fitness center, hot tub, on-site coffee house, and a business center. Pets are allowed on request although additional charges may apply. Rated 9.3 out of 10 Limelight Hotel Ketchum offers evening entertainment, free bike usage, skiing, fishing, games room, 24-hour front desk, banquet facilities, in-room coffee machine, ski pass vendor, on-site ski hire, ski storage, swimming pool, hot tub, fitness center, bar, restaurant, free WiFi, grocery delivery, and private parking for $15 per day. Pets are permitted at Limelight Hotel Ketchum but additional charges may apply. Rated 8.7 out of 10 The Westin Michigan Avenue is in the heart of Chicago and is highly rated for the comfort of their beds, and known for being one of the top choices among hotels that allow dogs in the state. The hotel offers rooms with a city view, great local shopping, in-room coffee machine and refrigerator, massage services, wellness center, fitness center, local attraction tickets, babysitting services, on-site coffee house, bar, restaurant, concierge services, on-site ATM, tour desk, 24-hour front desk, car hire, gift shop, and room service. WiFi is available for $14.95 per 24 hours and private parking is available for $71 per day. Pets are allowed and there are no additional charges associated with pet stays! Rated 9.5 out of 10 The Langham Chicago is situated in the heart of the city and is recommended for the comfort of their beds! Guests are offered rooms with a city or river view and free WiFi. Guests also have access to local attraction tickets, children’s indoor play area, bathroom emergency cords for handicapped-accessible rooms, in-room coffee machine, business center, banquet facilities, swimming pool, personal trainer, fitness classes, yoga, massage, spa, steam room, light therapy, indoor pool, hot tub, sauna, concierge service, on-site ATM, currency exchange, 24-hour front desk, bar, restaurant, minibar, room service, and secured private parking for a fee of $71 per day. Pets are allowed on request but additional fees may apply. Rated 9.1 out of 10 The Alexander is highly recommended for their location as well as for the comfort of their beds, and it’s one of the best hotels that allow dogs in the city. Guests have access to free WiFi, in-room coffee machine, fitness center, bar, restaurant, minibar, 24-hour front desk, room service, banquet facilities, and public parking nearby for $31 per day. Pets are allowed at The Alexander, but additional charges may apply. Rated 9.4 out of 10, Ironworks Hotel Indy is highly recommended for its location. The hotel provides rooms with a city view, free WiFi access, and free private parking on-site. Guests have access to an in-room coffee machine, fitness center, massage services, bar, minibar, restaurant, on-site ATM, business center, banquet facilities, and room service. Pets are allowed at the Ironworks Hotel Indy but additional charges may apply. Rated 9.6 out of 10 by guests overall and rated 10 for its location, My Place Hotel-Davenport offers free WiFi, free private parking on-site, and has a mini-mart on-site. Guests of the hotel also have access to kitchen facilities, a tea/coffee maker in-room, breakfast in-room, business center, visual aids for the blind, and a 24-hour front desk. Pets are allowed on request but additional charges may apply. Rated 9.6 out of 10 with a staff member rating of 9.7, The Current Iowa is recommended for their free on-site private parking, great coffee, free WiFi, and is in a great area for shopping as well as being known as one of the top hotels that allow dogs! Guests of the hotel have access to an in-room refrigerator and coffee machine, an indoor pool, a hot tub, a fitness center, bar, restaurant, minibar, concierge service, a 24-hour front desk, business center, banquet facilities, and room service. Guests with pets are permitted, but additional charges may apply. Rated 9.3 out of 10 overall by guests with a staff rating of 9.5, the Ambassador Hotel Wichita offers guests free WiFi access and free public parking. Guests of the hotel have access to an in-room refrigerator and coffee machine, a fitness center, restaurant, an on-site ATM, business center, 24-hour front desk, banquet facilities, and room service. Pets are allowed at the hotel on request but additional fees may apply. Rated 9.6 out of 10 by guests who also give the staff of the hotel a rating of 9.8 out of 10, Homewood Suites by Hilton at the Waterfront is known for their great coffee, free WiFi, and free on-site parking, and it’s one of the state’s best hotels that allow dogs. Guests have access to an in-room refrigerator and microwave, an indoor pool, hot tub, fitness center, an on-site ATM, 24-hour front desk, business center, banquet facilities, grocery deliveries, gift shop, and family rooms. Pets are permitted at the hotel on request, but additional charges may apply. Rated 9 out of 10 by guests, the 21C Museum Hotel is highly recommended for their food, local shopping, and location! Guests of the hotel have access to private parking for $29 a day, but WiFi is free of charge. Guests also have access to an in-room coffee machine, yoga classes, steam room, massage services, spa, fitness center, sauna, bar, restaurant, minibar, business center, banquet facilities, concierge service, on-site ATM, 24-hour front desk, room service, and a private entrance. Pets are allowed on request, but additional charges may be applicable. Rated 9.1 out of 10 by guests, Aloft Louisville Downtown is highly rated for its location and for local shopping and the chain is already known as having some of the best hotels that allow dogs. Guests have access to free WiFi and public parking is available on-site for a fee of $28 per day. Guests also have access to an in-room coffee machine and refrigerator, fitness center, bar, restaurant, business center, banquet facilities, and on-site mini-mart. Pets are permitted at the hotel and there are no additional charges associated with pet stays! Rated 8.5 out of 10 by guests overall and 9.2 for location, The Westin New Orleans Canal Place is recommended for the comfort of their beds and for being located in the heart of New Orleans! The hotel offers rooms with a city or river view, private on-site parking for a fee of $42 per day, and free WiFi access. Guests of the hotel have access to an in-room coffee machine, fitness center, bar, restaurant, concierge service, on-site ATM, 24-hour front desk, business center, banquet facilities, and room service. Pets are allowed to stay at the hotel, although additional charges may apply. Rated 9 out of 10 by guests, the Pontchartrain Hotel on St. Charles Avenue is recommended highly for the comfort of their beds and for local shopping as well as being known as top choice among hotels that allow dogs! The hotel offers free WiFi and public parking that costs $30 per day. Guests at the hotel have access to a bar, restaurant, minibar, concierge service, on-site ATM, 24-hour front desk, business center, and banquet facilities. Pets are allowed to stay at the hotel, but additional charges may be applied. Rated 9.4 out of 10 by guests, the Windsor Court Hotel offers free WiFi access and on-site parking for $48.40 per day. Guests have access to a swimming pool, massage services, fitness center, spa, on-site coffee house, bar, restaurant, in-room minibar, concierge service, on-site ATM, 24-hour front desk, babysitting services, business center, banquet facilities, VIP rooms, and room service. Pets are permitted at the hotel, but additional charges may apply. Rated 9.5 out of 10 by guests, the Inn by the Sea offers garden view rooms, offers access to a private beach, and is in a great location for shopping. Guests have access to in-room kitchen facilities, swimming pool, spa, fitness center, on-site bicycle rental, in-room breakfast, bar, restaurant, free on-site public and private parking, room service, banquet facilities, babysitting services, 24-hour front desk, and concierge services. Pets are allowed to stay at the hotel on request although additional charges may be applied. Rated 9.6 out of 10 by guests overall and 9.8 for location, Spruce Point Inn Resort and Spa is recommended for great local shopping and local activities and it’s one of the best hotels that allow dogs in the state. The hotel offers free WiFi access and free on-site public parking. Guests of the hotel have access to a swimming pool, hot tub, spa, massage services, fitness center, free on-site bike use, special diet menus on request, in-room snack bar, bar, restaurant, concierge service, 24-hour front desk, business center, banquet facilities, on-site shops, car hire service, gift shop, and room service. Pets are allowed to stay at the hotel on request and there are no additional charges associated with pet stays. Rated 8.7 out of 10 by guests, Kimpton Hotel Monaco Baltimore is highly rated for the comfort of their beds. The hotel offers free WiFi access and private on-site parking for $40 a day. Guests have access to a fitness center, bar, restaurant, in-room mini-bar, concierge service, 24-hour front desk, business center, banquet facilities, and room service. Pets are allowed to stay at the hotel on request but no additional charges are associated with pet stays. Rated 9.4 out of 10 by guests overall and rated 9.6 for staff, the Residence Inn by Marriott Ocean City offers rooms with a balcony and view, free on-site parking, great local shopping, and free WiFi access; it’s also well-known as one of the top choices among hotels that allow dogs. Guests at the hotel have access to in-room kitchen facilities, a swimming pool, yoga classes, fitness center, an in-room coffee/tea maker, bar, restaurant, on-site activities, tickets to local shows and attractions, 24-hour front desk, on-site ATM, business center, banquet facilities, and grocery deliveries. Rated 8.8 out of 10, The Liberty Hotel is located in the heart of Boston and is highly recommended for the comfort of their beds. The hotel offers rooms with a city or river view and is located in a great area for shopping. Guests of the hotel have access to a fitness center, bar, restaurant, minibar, free WiFi, on-site private parking for $57 per day, currency exchange services, 24-hour front desk, room service, business center, and banquet facilities. Pets are allowed to stay at the hotel on request but additional charges may apply. Rated 8.9 out of 10 by guests, XV Beacon Hotel is in the heart of Boston, offers great local shopping, and is top rated for the comfort of their beds and it’s one of state’s best hotels that allow dogs. The hotel offers free WiFi and private parking for $51 a day. Guests of the hotel have access to a hot tub, fitness center, in-room breakfast, bar, restaurant, minibar, concierge services, 24-hour front desk, banquet facilities, on-site shops, car hire, VIP rooms, and room service. Pets are permitted to stay at the hotel on request with no additional charges. Rated at 9 out of 10, the Berkshire Mountain Lodge is in a great location for shopping and offers free private parking on-site. The hotel offers guests plenty of local activities and free WiFi. Guests at the hotel also have access to kitchen facilities, an indoor swimming pool, hot tub, fitness center, sauna, business center, private entrance, gift shop, and a beauty/barber shop. Pets are permitted to stay at the hotel on request but additional charges may apply. Rated 8.4 out of 10 by guests, the Sheraton Detroit Novi Hotel is located in a great area for shopping and offers free private on-site parking. The hotel does offer WiFi but at a cost of $9.95 per 24 hours. Guests have access to a swimming pool, hot tub, spa, wellness center, fitness center, an on-site coffee house, special diet menus on request, snack bar, in-room breakfast, bar, restaurant, 24-hour front desk, currency exchange, business center, banquet facility, on-site mini-market, car hire, and room service. Guests are allowed to bring pets on request but additional charges may apply. Rated 8.8 out of 10 by guests overall and rated 9.8 out of 10 for location, East Bay Suites offers a private condo environment in an amazing location. It’s one of the more unique hotels that allow dogs and the suites offer free WiFi access and free on-site parking. Guests of the suites have access to private kitchen suites, free on-site bikes for use, and daily maid service. Pets are allowed to stay at the suites on request, but additional charges may apply. Rated 9.3 out of 10 by guests, the Hotel Ivy is located in a great area for shopping. Although the hotel offers WiFi and private parking they cost $14.95 per day and $39 per day respectively. Hotel guests have access to a hot tub, fitness center, massage services, wellness center, spa, special diet menus on request, in-room breakfast, minibar, restaurant, bar, concierge service, on-site ATM, 24-hour front desk, business center, banquet facilities, and room service. Pets are allowed to stay on request but additional charges may apply. Rated 9.7 out of 10 by guests, the Chancellor’s House Hotel offers guests rooms with a balcony and garden view. The hotel is in an ideal area for shopping and offers guests free WiFi access. Guests of the hotel have access to temporary art galleries, a library, evening entertainment, a bar, restaurant, banquet halls, private on-site parking for $25 per day, 24-hour front desk, and room service. Pets are allowed to stay at the hotel but additional fees may be charged. Rated 9.9 out of 10 by guests, the Hermann Hill Vineyard Inn & Spa is one of state’s top hotels that allow dogs and in a prime area for shopping and offers rooms with a balcony and a city or river view. The hotel also offers free private parking on-site and free WiFi. Guests at the hotel have access to a shared kitchen, spa facilities, yoga classes, pool, massage services, sauna, hot tub, wellness center, electric vehicle charging station, in-room coffee maker, special diet menus on request, in-room breakfast, 24-hour front desk, banquet facilities, on-site mini-mart, and soundproof rooms. Pets are allowed to stay at the hotel on request but additional charges may apply. Rated 9 out of 10 by guests overall, the Dreamcatcher Tipi Hotel is a novel hotel where guests stay in teepees and extremely comfortable beds, and it’s one of the most original hotels that allow dogs. Rooms have a mountain, landmark, or garden view, free on-site private parking is offered as well as free WiFi. Guests are given access to massage services, snack bar, bar, concierge service, on-site mini-market, mosquito nets, on-site shops, and a gift shop. Pets are welcome at the hotel but additional charges may apply. Rated 9.3 out of 10 by guests the Staybridge Suites Missoula is highly recommended for their food, comfortable beds, and they offer their guests free public parking on-site and free WiFi and it’s one of the top hotels that allow dogs. Guests at the hotel have access to kitchen facilities, ski storage, swimming pool, hot tub, fitness center, 24-hour front desk, an in-room tea/coffee maker, business center, banquet facilities, and an on-site mini-mart. Pets are permitted to stay on request but additional charges may apply. Rated 8.8 out of 10 by guests, the Magnolia Hotel Omaha is recommended for their comfortable beds and free WiFi access. On-site public parking is available for $20 a day. Guests at the hotel have access to a fitness center, bar, restaurant, on-site ATM, 24-hour front desk, business center, banquet facilities, and room service. Pets are allowed to stay at the hotel and no additional charges apply. Rated 8.7 out of 10 by guests, the Delano Las Vegas at Mandalay Bay is recommended for the comfort of their beds and the views from their rooms as well as being among state’s top hotels that allow dogs. Public parking on-site is available and costs $15 per day and while WiFi is available it comes with a daily fee. Guests have access to local attraction tickets, swimming pool, spa, beauty services, massage services, fitness center, sauna, in-room coffee maker and minibar, restaurant, bar, in-room breakfast, special diet menus on request, on-site coffee house, concierge service, currency exchange, 24-hour front desk, business center, banquet facilities, on-site shops, car hire, and room service. Pets are allowed to stay at the hotel but additional fees may be charged. Rated 9.2 out of 10 by guests, the Four Seasons Hotel Las Vegas is highly recommended for the comfort of their beds and their mountain views. Located in a great area for shopping, the hotel offers private parking for $32 per day and WiFi access for a daily fee and it’s one of the best hotels that allow dogs. Guests have access to a swimming pool, hot tub, massage services, spa, fitness center, in-room breakfast, bar, restaurant, minibar, electric vehicle charging station, concierge service, on-site ATM, currency exchange, 24-hour front desk, babysitting services, business center, banquet facilities, on-site shops, car hire, gift shop, and room service. Pets are permitted to stay on request but additional charges may apply. Rated 9.8 out of 10 by guests, the Chesterfield Inn is also rated 10 out of 10 for their staff and guests know it as one of the top hotels that allow dogs! The hotel offers balcony rooms with garden views, free WiFi, free on-site private parking, and the area has great local shopping. Guests have access to an in-room refrigerator, massage services, in-room mini-bar, restaurant, bar, in-room breakfast, special diet menus on request, soundproofed rooms, concierge service, banquet facilities, and room service. Pets are permitted to stay at the hotel with no extra charges. Rated 8.8 out of 10, W Hoboken hotel is one of the state’s best hotels that allow dogs and recommended for their comfortable beds and their rooms with a river or city view. Located in a great area for shopping, the W Hoboken hotel offers guests WiFi access for $10 per 24 hours and private parking for $35 per day. Guests have access to an in-room coffee machine, spa, wellness center, fitness center, free access to bikes on-site, bar, restaurant, in-room mini-bar, electric vehicle charging station, 24-hour front desk, concierge service, on-site ATM, business center, banquet facilities, on-site shops, and room service. Pets are allowed to stay at the hotel on request but additional fees may apply. Rated 9.2 out of 10 by guests and recommended for the comfort of their beds and the view from their rooms. The hotel offers free WiFi access and free on-site parking as well as great local shopping. Guests of the hotel have access to an in-room refrigerator, yoga classes, fitness center, hot tub, massage services, bicycle rental, bar, concierge services, ticket services, 24-hour front desk, business center, banquet facilities, and soundproof rooms. Pets are permitted on request but additional charges may apply. Rated 9.6 out of 10, Rosewood Inn of the Anasazi is recommended for their location and local shopping as well as the comfort of their beds. The hotel is one of the top hotels that allow dogs and it offers free WiFi access and private parking is available but costs $25 per day. Guests have access to a fitness center, massage services, tickets to local attractions, on-site bicycle rental, evening entertainment, live music, library, babysitting services, 24-hour front desk, concierge service, special diet menus on request, in-room breakfast, restaurant, bar, minibar, tea/coffee maker in-room, banquet facilities, car hire, packed lunches, and room service. Pets are allowed to stay at the hotel but additional charges may apply. Rated 8.7 out of 10 by guests, The Peninsula New York is in the heart of the city and offers great local shopping and rooms with a view. Free WiFi is available for guests and on-site public parking is available but costs $65 per day. Guests of the hotel have access to a swimming pool, personal trainer, fitness classes, yoga, spa, massage services, sauna, live music, walking tours, special diet menus on request, in-room breakfast, bar, restaurant, minibar, concierge service, on-site ATM, tour desk, currency exchange, 24-hour front desk, babysitting services, banquet facilities, grocery delivery, soundproof rooms, and room service. Pets are allowed to stay at the hotel but additional charges may apply. Rated 9.4 out of 10 by guests The Greenwich Hotel is in the heart of New York City and is highly recommended for the comfort of their beds and local shopping as well as being one of the best hotels that allow dogs. The hotel offers free WiFi and public on-site parking that does come at an undisclosed fee. Guests have access to a swimming pool, personal trainer, fitness classes, yoga classes, spa, fitness center, tickets to local attractions and shows, in-room breakfast, special diet menus, bar, restaurant, in-room mini-bar, concierge services, 24-hour front desk, babysitting services, car hire, VIP room facilities, and room service. Pets are allowed at the hotel on request but additional charges may apply. Rated 9 out of 10 by guests, The Lowell is located in the heart of the city and has great local shopping and is known as one of the top hotels that allow dogs. The hotel offers free WiFi and private parking for an undisclosed fee. Guests have access to a fitness center, in-room breakfast, bar, restaurant, concierge service, 24-hour front desk, tour desk, and room service. Pets are allowed to stay at the hotel but additional fees may apply. Rated 9.4 out of 10 by guests looking for great hotels that allow dogs, the Washington Duke Inn & Golf Club offers rooms with a view, free on-site parking, great local shopping, and free WiFi. Guests have access to a swimming pool, hot tub, fitness center, in-room coffee machine, special diet menus on request, in-room breakfast, minibar, restaurant, concierge service, on-site ATM, 24-hour front desk, babysitting services, business center, banquet facilities, gift shop, and room service. Pets are allowed at the hotel but additional charges may apply. Rated 9.5 out of 10 by guests, the ClubHouse Hotel & Suites Fargo is located in a great area for shopping and offers free WiFi and free private parking on-site. Guests have access to a swimming pool, fitness center, water slide, hot tub, bar, restaurant, snack bar, business center, banquet facilities, and room service. Pets are allowed to stay at the hotel and no additional fees are charged for pet stays! Rated 9 out of 10 by guests, the Metropolitan at The 9 is in a great area for shopping and is recommended for their comfortable beds and it’s one of the best hotels that allow dogs. Guests have access to a fitness center, bar, restaurant, free WiFi, private parking for a daily fee of $32, concierge service, 24-hour front desk, and room service. Pets are allowed at the hotel on request but additional fees may apply. Rated 9.3 out of 10 by guests, Hotel LeVenque is highly recommended for the comfort of their beds and their local shopping! The hotel offers free WiFi and on-site parking for a daily fee of $26. Guests have access to a fitness center, an on-site coffee house, bar, restaurant, concierge service, 24-hour front desk, business center, banquet facilities, and room service. Pets are allowed to stay at the hotel but additional charges may apply. Rated 9.4 out of 10 by guests, the Colcord Hotel is recommended for great local shopping, free WiFi access, and their comfortable beds. On-site parking is available for a cost of $25 per day. Guests have access to a fitness center, restaurant, business center, 24-hour front desk, and banquet facilities. Pets are allowed to stay at the hotel on request but additional charges may apply. Rated 9 out of 10 by guests The Benson is the only favorite among hotels that allow dogs in the state. It is located in the heart of the city, offers city views, great shopping, comfortable beds, and free WiFi. Guests at the hotel have access to a fitness center, bar, restaurant, in-room coffee/tea maker, nearby private parking for $40 per day, concierge service, on-site ATM, 24-hour front desk, business center, banquet facilities, and room service. Pets are allowed to stay at the hotel, but additional charges may apply. Rated 9.3 out of 10 by guests, The Rittenhouse Hotel is the first to mention among hotels that allow dogs in the state. It is located in the heart of the city, offers great local shopping, and is highly recommended for the comfort of their beds! The hotel offers free WiFi access and private on-site parking is available for $52 per day. Guests have access to an indoor pool, massage services, spa, fitness center, steam room, sauna, bar, restaurant, minibar, in-room breakfast, in-room coffee/tea maker, on-site ATM, ticket services, currency exchange, 24-hour front desk, babysitting services, business center, banquet facilities, car hire, gift shop, VIP rooms, barber/beauty facilities, and room service. Pets are allowed to stay at the hotel but additional charges may apply. Rated 9 out of 10 by guests, The Windsor Suites Philadelphia is located in the heart of the city, offers rooms with a balcony and a view, has great local shopping, and is recommended for their comfortable beds! Private parking is available on-site but does cost $42 per day. Guests have access to kitchen facilities, swimming pool, fitness classes, fitness center, tickets to local attractions, bar, restaurant, concierge service, on-site ATM, 24-hour front desk, business center, banquet facilities, grocery deliveries, car hire, and room service. Pets are allowed to stay at the hotel although additional charges may apply. Rated 9.1 out of 10 by guests, the Kimpton Hotel Monaco Philadelphia is the last essential mention of state’s best hotels that allow dogs and it offers great local shopping, rooms with a view, and is highly recommended for the comfort of their beds. The hotel offers free WiFi access and nearby public parking is possible but will cost $50 per day. Guests have access to a fitness center, massage services, on-site bicycle rental, bar, restaurant, minibar, concierge service, on-site ATM, 24-hour front desk, business center, banquet facility, packed lunches, and room service. Pets are allowed to stay at the hotel and there are no additional charges! Rated 9 out of 10 by guests, Grace Vanderbilt hotel offers rooms with a view and is in a great area for shopping. The hotel offers free WiFi access, and private on-site parking is available for a non-disclosed fee. Guests have access to an in-room refrigerator, swimming pool (indoor and outdoor), yoga classes, fitness center, spa, sauna, library, in-room breakfast, restaurant, bar, minibar, concierge service, ticket service, tour desk, 24-hour front desk, baby safety gates, business center, banquet facilities, VIP facilities, and room service. Pets are allowed to stay at the hotel but additional charges may apply. Rated 9.4 out of 10 by guests, Belmond Charleston Place is our favorite one among hotels that allow dogs in the state; it’s in the heart of the city, offers great local shopping, and is recommended by guests for their comfortable beds. The hotel offers free WiFi service and private on-site parking is available for $34 per day. Guests have access to a swimming pool (indoor and outdoor), beauty services, pool bar, hot tub, massage services, spa, fitness center, sauna, on-site bicycle rental, in-room breakfast, restaurant, bar, minibar, concierge service, ticket service, tour desk, currency exchange, 24-hour front desk, babysitting services, business center, banquet facilities, on-site shops, car hire, gift shop, VIP facilities, and room service. Pets are allowed to stay at the hotel but additional fees may apply. Rated 9.3 out of 10 by guests, the ClubHouse Hotel Sioux Falls is in a great area for shopping and offers free WiFi access and free on-site parking and it’s a highly recommended one among hotels that allow dogs. Guests have access to a swimming pool, fitness center, water slide, hot tub, tickets to local attractions, a local water park, library, free bicycles for use, bar, restaurant, concierge service, 24-hour front desk, business center, banquet facilities, grocery delivery, VIP facilities, and room service. Pets are allowed to stay at the hotel and no additional charges apply! Rated 9 out of 10 by guests, Loews Vanderbilt Nashville is easily one of the best hotels that allow dogs in the state, it’s in a great area for shopping and is highly recommended for the comfort of their beds. The hotel offers free WiFi access and on-site parking is available for $39 per day. Guests have access to a fitness center, personal trainer, on-site coffee house, special diet menus on request, snack bar, in-room breakfast, bar, restaurant, concierge service, on-site ATM, 24-hour front desk, baby safety gates, business center, banquet facilities, on-site mini-mart, car hire, gift shop, and room service. Pets are allowed to stay at the hotel but additional charges may apply. Rated 9.1 out of 10 by guests, 21c Museum Hotel Nashville offers great local shopping and free WiFi, and is one of our favorite hotels that allow dogs The hotel offers private on-site parking for $38 per day. Guests have access to massage services, spa, fitness center, special diet menus on request, in-room breakfast, restaurant, bar, concierge service, on-site ATM, 24-hour front desk, business center, banquet facilities, gift shop, VIP facilities, and room service. Pets are allowed to stay at the hotel but additional charges may apply. Rated 9.5 out of 10 by guests, Carnegie Hotel is in a great local shopping area, offers free on-site parking, free wi-fi, and is highly recommended for the comfort of their beds, and it’s one of the best hotels that allow dogs in the state. Guests have access to an in-room refrigerator, swimming pool, spa, beauty/barber facility, massage services, fitness center, library, bar, restaurant concierge service, on-site ATM, 24-hour front desk, business center, banquet facilities, gift shop, VIP facilities, and room service. Pets are allowed to stay at the hotel on request but additional charges may apply. Rated 9.1 out of 10 by guests, The St. Anthony Hotel is in the heart of San Antonio, offers great local shopping and is recommended by guests for the comfort of their beds! The hotel offers free WiFi and private on-site parking for a fee of $30 per day. Guests have access to an in-room coffee machine, swimming pool, fitness center, bar, restaurant, concierge service, on-site ATM, 24-hour front desk, business center, banquet facilities, and room service. Pets are allowed to stay at the hotel on request but additional charges may apply. Rated 9.2 out of 10 by guests, the Hotel Granduca Houston is one of the state’s best hotels that allow dogs and is in a great location for shopping, offers rooms with a pool view, and is recommended by guests for their comfortable beds! The hotel offers free WiFi and private parking is available on-site for $29 per day. Guests can enjoy an in-room coffee machine and microwave, swimming pool, fitness center, pool bar, hot tub, massage services, snack bar, bar, restaurant, minibar, concierge service, ticket services, 24-hour front desk, babysitting services, business center, banquet facilities, gift shop, and room service. Pets are allowed to stay at the hotel although additional charges may apply. Rated 9 out of 10 by guests, the Monaco Salt Lake City offers rooms with a city view, great local shopping, and is recommended by guests for their comfortable beds. The hotel offers WiFi for an undisclosed fee and private parking on-site is available for $24 per day. Guests have access to an in-room coffee maker, fitness center, massage services, special diet menus on request, in-room breakfast, bar, restaurant, concierge service, on-site ATM, 24-hour front desk, babysitting services, business center, banquet facilities, and room service. Pets are allowed to stay at the hotel and there are no additional fees for pet stays! Rated 8.9 out of 10 by guests, the Red Mountain Resort is another one of the great hotels that allow dogs in the state and offers rooms with a patio and landmark or pool view and is in a great area for shopping. The hotel also offers free on-site parking and free WiFi. Guests can enjoy an in-room coffee machine, swimming pool (indoor and outdoor), fitness center, personal trainer, yoga classes, fitness classes, spa, steam room, barber/beauty services, massage services, hot tub, tickets to local attractions, bicycle rental, on-site coffee house, snack bar, bar, restaurant, concierge service, tour desk, 24-hour front desk, business center, banquet facilities, on-site shops, gift shop, and room service. Pets are permitted on request but additional charges may apply. *This resort does not allow children under 12 years old. Rated 8.8 out of 10, the Topnotch Resort is the first one of hotels that allow dogs to mention, it’s in a great shopping area and is highly rated for the comfort of their beds. The hotel offers free WiFi and free on-site private parking. Guests have access to ski passes (for purchase), ski equipment hire, ski storage, swimming pool, hot tub, massage services, fitness center, sauna, bicycle rental, special diet menus on request, in-room breakfast, bar, restaurant, minibar, concierge service, tour desk, 24-hour front desk, babysitting services, banquet facilities, on-site shops, packed lunches, VIP facilities, barber/beauty shop, and room service. Pets are permitted on request but additional charges may apply. Rated 8.9 out of 10 the Mountain Top Inn and Resort offers rooms with a lake or mountain view, rooms with a patio, great local shopping, free WiFi in public areas, and free private parking on-site. Guests have access to an in-room coffee machine, ski equipment hire on-site, swimming pool, yoga classes, fitness center, spa, beauty/barber shop, hot tub, sauna, bar, restaurant, business center, banquet facilities, packed lunches, gift shop, and room service. Pets are allowed at the hotel on request but additional charges may apply. Rated 9.2 out of 10 by guests, the Homewood Suites by Hilton Burlington is highly rated for its location, local shopping, and great food and is one of the best hotels that allow dogs in the state. The hotel offers free WiFi and free on-site private parking. Guests can enjoy a swimming pool (indoor), hot tub, fitness center, electric vehicle charging station, business center, 24-hour front desk, and on-site mini-market. Pets are allowed at the hotel on request but additional charges may apply. Rated 9.4 out of 10 by guests, Salamander Resort and Spa is in a great area for shopping and offers guests free private parking on-site and free WiFi. Guests have access to a swimming pool (indoor), hot tub, massage services, spa, fitness center, sauna, bicycle rental, special diet menus on request, in-room breakfast, restaurant, bar, concierge service, currency exchange, 24-hour front desk, babysitting services, business center, banquet facilities, car hire, gift shop, barber/beauty shop, and room service. Pets are allowed to stay at the hotel on request but additional charges may apply. Rated 9 out of 10 by guests, The Westin Arlington Gateway is recommended for local shopping and the comfort of their beds. The hotel offers free WiFi and private on-site parking is available for $34 per day. Guests can enjoy an in-room coffee machine, swimming pool (indoor), fitness center, hot tub, on-site coffee house, in-room breakfast, bar, restaurant, concierge service, on-site ATM, currency exchange, 24-hour front desk, business center, banquet facilities, and room service. Pets are allowed to stay at the hotel on request and there are no additional fees for pet guests! Rated 9 out of 10 by guests, the Quirk Hotel is recommended for their local shopping and the comfort of their beds and is one of the best hotels that allow dogs! The hotel offers free WiFi in public areas and private nearby parking is available for $22 per day. Guests can enjoy a fitness center, bar, restaurant, minibar, concierge service, 24-hour front desk, business center, banquet facilities, allergy-free rooms, on-site shops, private room entrances, gift shop, VIP facilities, and room service. Pets are allowed to stay at the hotel but additional charges may apply. Rated 8.9 out of 10 by guests, the Kimpton Hotel Vintage Seattle is located in the heart of the city in a great area for shopping and is highly recommended for the comfort of their beds. The hotel offers WiFi access for an undisclosed fee and on-site public parking for $42 per day. Guests have access to an in-room coffee machine, fitness center, massage, free bicycle use, special diet menus on request, bar, restaurant, minibar, concierge service, on-site ATM, 24-hour front desk, banquet facilities, and room service. Pets are allowed to stay at the hotel on request but additional charges may apply. Rated 9.2 out of 10 by guests the Fairmont Olympic Hotel is in the heart of Seattle, is in a great location for shopping and is highly recommended for the comfort of their beds, and is easily one of the best hotels that allow dogs! Guests have access to WiFi for $15.95 per 24 hours and private on-site parking is available for $55 per day. Guests have access to a swimming pool (indoor), fitness center, sauna, spa, massage services, hot tub, beauty services, light therapy, tickets to local attractions, on-site coffee house, special diet menus, in-room breakfast, snack bar, bar, restaurant, minibar, concierge service, on-site ATM, ticket service, tour desk, currency exchange, 24-hour front desk, strollers, babysitting services, business center, banquet facilities, on-site shops, car hire, packed lunches, gift shop, and room service. Pets are permitted at the hotel but additional charges may apply. Rated 9.2 out of 10 by guests, the W Bellevue is in a great area for local shopping and offers rooms with a city view. The hotel offers WiFi access for $12.95 per 24-hours and on-site public parking for $28 per day. Guests have access to a swimming pool (indoor), fitness center, library, restaurant, concierge service, on-site ATM, 24-hour front desk, business center, banquet facilities, and hypo-allergenic rooms. While it’s one of the best hotels that allow dogs and pets are allowed to stay at the hotel, additional charges may apply. Rated 9.2 out of 10 by guests, The Jefferson Hotel is in the heart of Washington DC, offers great local shopping, rooms with a city view, and is highly recommended for the comfort of their beds. The hotel offers free WiFi and private on-site parking for $55 per day. Guests have access to massage services, spa, fitness center, tickets to local attractions, special diet menus on request, in-room breakfast, bar, restaurant, electric vehicle charging station, concierge service, 24-hour front desk, banquet facilities, hypoallergenic rooms, soundproof rooms, and room service. Pets are allowed to stay at the hotel but additional charges may apply. Rated 9.5 out of 10 by guests, the Blennerhassett is located in a great area for shopping and is highly rated for the comfort of their beds, and it’s one of the best hotels that allow dogs in the state. The hotel offers free WiFi and free on-site private parking. Guests have access to an in-room coffee machine, fitness center, tickets to local attractions, library, on-site coffee house, bar, restaurant, 24-hour front desk, business center, banquet facilities, hypoallergenic rooms, gift shop, and room service. Pets are permitted at the hotel on request but additional fees may apply. Rated 8.8 out of 10 by guests, HotelRed is in a great area for shopping, offers rooms with a city view, free WiFi, and free on-site private parking. Guests have access to kitchen facilities, a fitness center, bicycle rental, special diet menus on request, bar, restaurant, minibar, concierge service, on-site ATM, 24-hour front desk, business center, banquet facilities, grocery deliveries, and room service. Pets are allowed to stay at the hotel but additional fees may apply. Rated 9.2 out of 10, The Westin Milwaukee is highly recommended for its location and local shopping and is one of the best hotels that allow dogs in Wisconsin. The hotel offers WiFi for $15 per 24-hours and nearby public parking for $50 per day. Guests can enjoy a fitness center, bar, restaurant, concierge service, on-site ATM, 24-hour front desk, business center, banquet facilities, and room service. Pets are allowed to stay at the hotel and there are no additional fees for pet stays! Rated 9.6 out of 10 by guests, the Staybridge Suites Cheyenne is in a great area for local shopping and is recommended by guests for the comfort of their beds. The hotel offers free WiFi and free on-site parking. Guests have access to a swimming pool, fitness center, business center, and banquet facilities. Pets are allowed to stay at the hotel on request but additional charges may apply. The last one of our favorite USA hotels that allow dogs, rated 8.8 out of 10 by guests, the Teton Mountain Lodge and Spa is in a great area for shopping and guests highly recommend the hotel for the comfort of their beds! The hotel offers WiFi for an undisclosed fee and on-site public parking is available for an undisclosed fee. Guests have access to an in-room refrigerator, swimming pool (indoor and outdoor), fitness center, spa, steam room, beauty services, hot tub, massage services, tickets to local attractions, bicycle rental, skiing, special diet menus on request, snack bar, in-room breakfast, bar, restaurant, concierge service, on-site ATM, ticket services, tour desk, 24-hour front desk, indoor play area, babysitting services, business center, banquet facilities, grocery deliveries, on-site mini-mart, hypoallergenic rooms, on-site shops, packed lunches, gift shop, VIP facilities, and room service. Pets are allowed to stay at the hotel on request but additional charges may apply.